In addition to the columns described in the stories, we have also added created_at and updated_at columns. We will configure Symfony 4 to set their value automatically when an object is saved or updated. To store the jobs, affiliates and categories in the database, Symfony 4 uses Doctrine ORM. To define the database connection parameters you have to edit the .env file (for this tutorial we will use MySQL). For each type of object we need, we will create an entity class (just a simple PHP class with some properties). To tell Doctrine about our objects, we will create “metadata” that will describe how our objects will be stored in the database. We will use annotations for this project but you can also use YAML or XML files to achieve the same result. [OK] The mapping files are correct. 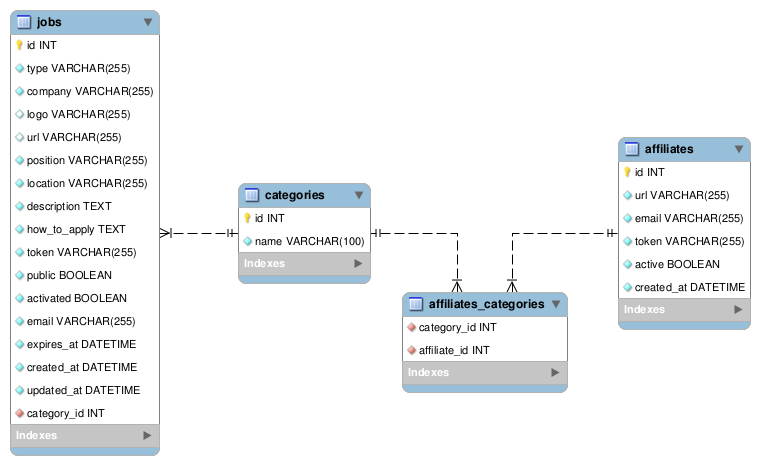 [ERROR] The database schema is not in sync with the current mapping file. Don’t worry about that error for now. We will fix it in a few minutes. Fists of all we should create constructors in entities with OneToMany or ManyToMany relations. Collection property, such as $categories, must be a collection object that implements Doctrine’s Collection interface. In this case, an ArrayCollection object is used. This looks and acts almost exactly like an array, but has some added flexibility. Just imagine that it’s an array and you’ll be in good shape. As you can notice, all properties are private but we should access them somehow. Let’s generate setters and getters. If you use an IDE like PHPStorm, it can generate these for you. In PHPStorm, put your cursor anywhere in the class, then go to the Code -> Generate menu and select "Getters and Setters" (Alt + Insert). Notice #1: for boolean variables we generate is and set methods, for collections we generate get, add and remove but for everyone else we generate get and set methods. Notice #2: for ID we generate ONLY getter. We don’t have case when to set id, but doctrine knows how to set ID without setter. Sometimes, you need to perform an action right before or after an entity is inserted, updated, or deleted. These types of actions are known as “lifecycle” callbacks, as they’re callback methods that you need to execute during different stages of the lifecycle of an entity (e.g. the entity is inserted, updated, deleted, etc). We already added the created_at and updated_at properties in our Job and Affiliate classes, and it will be great if Doctrine will update them automatically when needed. Now DB will have all information described in entities. The tables have been created in the database but there is no data in them. For any web application, there are three types of data: initial data (this is needed for the application to work, in our case we some initial categories and an admin user), test data (needed for the application to be tested) and user data (created by the users during the normal life of the application). Now that everything is set up we will create some new classes to load data in a new folder in our bundle: src/DataFixtures. Maybe you noticed that this fixture is not as the previous one. In this fixture we implemented DependentFixtureInterface interface and defined method getDependencies. This method helps DoctrineFixturesBundle to define the order of execution of fixtures. In our case JobFixtures depends on categories and CategoryFixtures should be executed earlier. Now check your database, you should see the data loaded into tables. You can find the code from day 3 here: https://github.com/gregurco/jobeet/tree/day3.